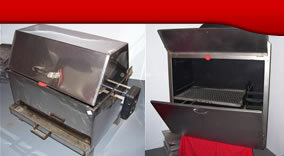 Fixtrade are manufacturers of baking, braai (barbeque), and liquid containers, from high quality stainless steel. Please take a look through the various categories on our site - I am sure that you will find something here that you've always wanted to own! We manufacture a range of stainless steel baking related products, including bread pans, biscuit pans, cake pans and rusk cutters. With many years of experience in the South African Braaing industry, we have developed a range of braai products and braai accessories with our clients in mind. Whether you are a regular camper and require a portable unit, or a home entertainer and require a motorised spit braai, we have the right equipment for you. Take a look at our Braai Accessories page for many useful tools that you no doubt would like to own. Our containers category covers a broad range of items, including food and water bowls for pets, milk buckets, milk cans, yogurt cans, as well as general liquid containers suitable for transporting produce on the farm and to the market. Finally, we have a number of tables, covering most applications that stainless tables are required for. If there is a product that you require, that you do not see here, please email us as we may have what you are looking for.